Your bus picks you up about 10 am depending on traffic situations from your hotel in Los Angeles. Spend 5 hours seeing the city’s highlights with your private group and enjoy the city of Los Angeles. Look for your favorite celebrity’s star on the Hollywood Walk of Fame. See Madame Tussad’s Wax Museum, Hard Rock Cafe, Dolby Theater the new home of Oscars and many other fun attractions along world famous Hollywood Boulevard. Enjoy complimentary snacks and bottled water. 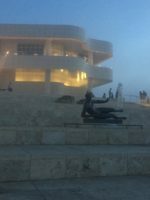 Stop at Getty Museum where you can spend 2 hours and explore the Modern Outdoor Sculpture. The Fran and Ray Sculpture Collections, Modern British Sculpture. Keep your camera ready and take lots of pictures of your friends, and families at The Fran and Ray Stark Sculpture Garden which is beautiful and must see. Watch the Orientation Film and Self Guided Tours where you can Explore the collection and exhibitions for Free at the at the Getty Guide Desk in the Entrance Hall. The tour can take from 4- 5 hours depending on the stops requested. Your round trip hotel transport, snacks and water are covered. $5.00 Subway Gift Card will be given on your tour as a complimentary. Minimum of 6- 15 passengers required at the time of booking. The tour is non refundable once booked.